A colleague at work bought a Geneva Labs model xl this insipred me to take a closer look at the grandest of all iPad docks. I had always assumed that it had a huge bass speaker in the middle and a couple of angled tweeters firing from the outer corners to create a degree of stereo effect. At least this is what the semantics of the design said. But in our time semantics are for telling stories, not for Describing functionality. Inside the Geneva xl has a stereo set of three way speakers placed as close together as possible. What was going on here? So… I had to find out what was going on here. 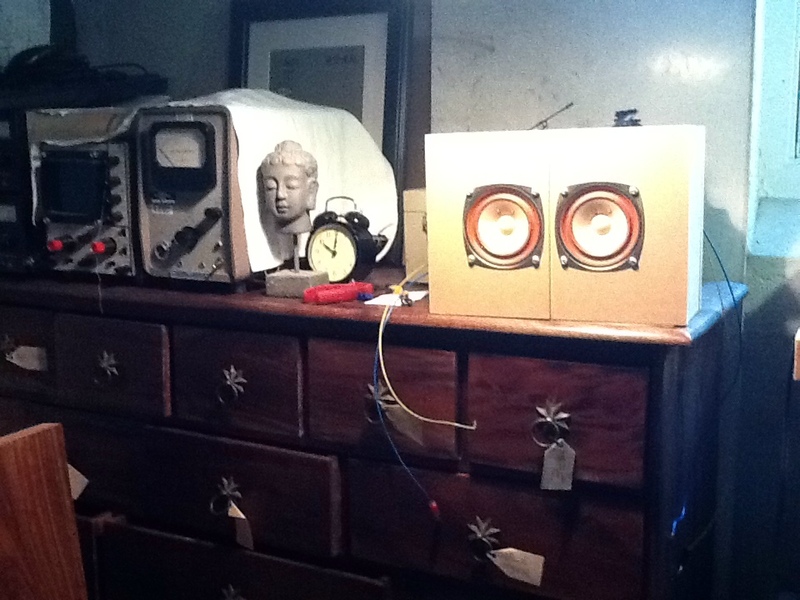 I had a couple of Fostex FE103´s lying around, and glued together two closed speaker boxes side by side. In between the speaker elements I cut the MDF so I could slot in a piece of aluminum or plastic. Listening tests showed that this divider contributed somewhat to dividing the output of the two speakers. When the listener was positioned in front of the speakers. The 30mm dividing strip is not in place in this picture. But you can see the slot it goes into. By reversing polarity on one of them I got the typical effect of floating the sound out on each side of the listeners ears. I used Rouge Amoeba´s Audio Highjack Pro to hijack system output from my MacBook Pro. I set up a high pass and a low pass filter where the lowpass was bass boosted a bit and sent straight to output, creating a in-phase bass line, while the high pass was divided in left and right channel and phase shifted using the Flux SST stereo tool. This combination gave a nice mixture of center image and wide open sound. My Good Wife was impressed. Though not by the looks. “That´s not coming into the living room, right?” I don’t think this is the trick Embracing Sound Experience is using, but it sounded quite OK. Only problem was the SST tools were pulling 100% of the computers system resources. Oh, and the FE103´s don’t deserve the name full range – they are mid-high tweeters. 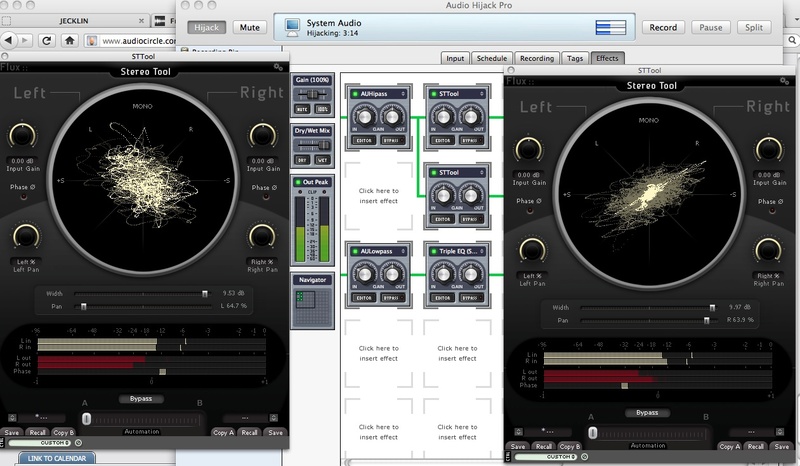 Screen dump of Audio Highjack Pro and the Flux SST tools.